Since Swarthmore grants its students a week off six weeks into fall semester, I decided that I would spend that time back home in sunny Los Angeles. My CFO had sent me an article in the Los Angeles Times highlighting a Renaissance art exhibit at the nearby Huntington Library and Museum, and I knew I simply had to visit this showing of works in which I am particularly well schooled. "Face to Face", located in the Boone Gallery, presents what is quite the interesting art-historical juxtaposition. During the 1400s, Florence and Flanders were the twin capitals of Europe artistically and financially, so to speak. This exhibit focused on the spread of Flemish painting techniques to Florentine art, comparing several different genres of painting and displaying the keen influence that many people who know of Italian Renaissance art may well take for granted. The Flemish typically focused on surface, light, effect, while Florentine art was concerned with proper proportion and line. The Flemish brought oil paints and laborious attention to detail and texture to the Florentine tradition of grandeur and monumentalism, forever changing both the dialogue between these two political entities and the direction Italian Renaissance art would take. The scope of the exhibit is quite impressive, especially for an exhibit in the U.S. that isn't in one of the "Big Four" museums. The Huntington has managed to borrow works by several of the masters of Flemish art, including Hans Memling and Rogier van der Weyden (whose Philadelphia Crucifix I have written about here). This exhibit has intricately rendered Flemish diptychs and illuminated manuscripts galore, providing what is surely a useful introduction to Flemish art for those not in the know. While the works that the exhibit uses to highlight the spreading of Flemish styles to Italy are quite apt, as a whole, the Italian section of the exhibit lacks the same awe-provoking response. One of the best moments of the exhibit is the juxtaposition of Memling's and Domenico Ghirlandaio's "Man of Sorrows", the latter a copy of the former. Domenico Ghirlandaio, who served as Michelangelo's first master, was instrumental in bringing Flemish artistic idiosyncrasies to his patrician Florentine audience. While Memling's weeping Christ figure is rendered in subtle velvety tones, Ghirlandaio's copy of the work, painted in tempera, is, in the Italian tradition, more strongly delineated. While Ghirlandaio lacks both the ingenuity and the name recognition of his Italian brethren, his effective, vital draftsmanship proved instrumental in this influential artistic exchange. Additionally, the treatment of the figure himself reveals another interesting contrast in Flemish and Italian styles: while Memling's Christ is presented simply, without adornment, Ghirlandaio's Christ has quintessentially Italian halo-lines and is flanked by an elegant column with a carved capital. 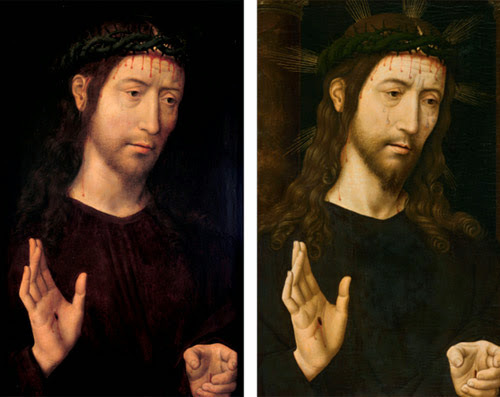 Left: Hans Memling, "Man of Sorrows", 1480-90. Right: Domenico Ghirlandaio, "Man of Sorrows", 1490. This type of explicit comparison is where the exhibit succeeds best. Other moments of comparison are far more subtle; for example, an entire room devoted to the incorporation of landscape painting and portraiture is fascinating and satisfying. 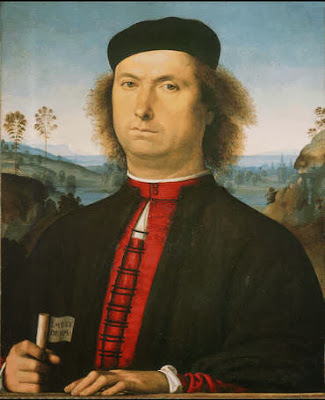 Perugino's arresting "Portrait of Francesco delle Opere" (shown below), painted in 1492, is the jewel of this category, combining not only Flemish oil with Florentine tempera but also the serene Flemish landscapes and three-quarter view with typical Italian draftsmanship and strength of line. Unfortunately, other aspects of this show left me wanting. For example, the inclusion of so many Flemish manuscripts, while useful in their own way for presenting aspects of Flemish art, do not really add much to the overall theme of what is on display, since there is less of an equivalent tradition of Italian illuminated manuscripts during this time. At least, that is what this exhibit portends; if there were in fact relevant Italian manuscripts, why not include them? The inclusion of only Flemish manuscripts serves merely to reiterate traits of Flemish art that are already conveyed in the Flemish paintings on display, which actually have displayed Italian counterparts. I also wish this exhibit had addressed what, if anything, is lost when distinct art styles blend together stylistically. Did Florentine art lose anything of its uniqueness by adopting Flemish characteristics? Should we, as viewers or as historians, care? This exhibit raises more questions than it cares to answer. This exhibit runs until January 13. For those interested in art history, it's worth a look, yet it might not resonate for more casual viewers. 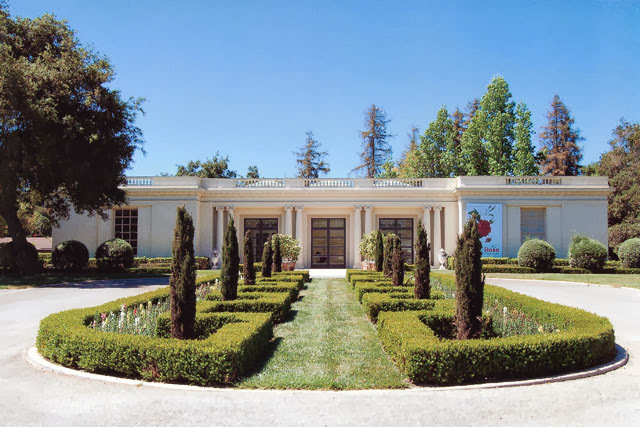 The Huntington estate, however, is worth at least an afternoon of wandering the gardens and other galleries, which contain a fantastic array of American art. As a more "casual viewer" I can say that I did learn a bit about the impact Flemish art had on Florentine art. Because I knew next to nothing, what was presented here was informative. But then, I had my own personal docent. :) I do think that perhaps for those more schooled, the exhibit may be lacking, but for neophytes it is quite good. I like your analysis however, as it comes from one with a trained eye.